This interactive map enables you to explore specific policies in your state. This table contains the full list of rankings. Well, on the brighter side, those same policies/laws have made all those three states excellent places for labor attorneys to work. I'm not sure that some of them have any labor laws left to litigate. You may have thought that funny, but actually the fewer the labor laws, the more litigation. Places like California, that have everything spelled out to a great detail, get things settled administratively. Mississippi, which has basically no labor laws (other than keepin' them New York Jewish organizers out) is a rats nest for lawsuits. What in most states would be a labor violation turns into a personal injury in Mississippi. but actually the fewer the labor laws, the more litigation. Places like California, that have everything spelled out to a great detail, get things settled administratively. Mississippi, which has basically no labor laws (other than keepin' them New York Jewish organizers out) is a rats nest for lawsuits. What in most states would be a labor violation turns into a personal injury in Mississippi. Maybe a slight exaggeration, but "intentional infliction of emotional distress" covers a lot of ground. Keep in mind, though, that most of the factors in the rating scale are all federal, which the states can enhance on, but can't change. Minimum wage, various protective laws and right to organize derive initially from federal law. The ratings were actually which states do a better job of having better laws than the federal, i.e., higher minimum wage, required paid leave, etc. The only one where the states have the greater clout is in union membership, particularly in public sector. Federal law gives the right to organize, but states can make it hard by restricting employer deduction of dues, for example. All in all, though, I favor the Cali approach over the Mississippi approach. It appears a new trade agreement has replaced NAFTA - The USMCA (United States Mexico Canada Agreement). Improved labor and environmental rights. The new USMCA makes a number of significant upgrades to environmental and labor regulations, especially regarding Mexico. For example, USMCA stipulates that Mexican trucks that cross the border into the United States must meet higher safety regulations and Mexican workers must have more ability to organize and form unions. Some of these provisions might be difficult to enforce, but the Trump administration says it is committed to ensuring these happen — a reason U.S. labor unions and some Democrats are cheering the new rules. ... Thoughts on the agreement? No opinion yet. Heard on NPR that the ratification vote won't come until 2019, so we'll have lots of time to examine the details. Members of the public frequently complained about a department head. A department employee went to the County Mayor about this. The department head eliminated the employee's position. The employee sued claiming illegal discrimination/retaliation and won. The county appealed, leading the employee to also appeal. Fairly routine stuff to this point. What made it worth sharing to me is that the appeals court doubled the award to the employee. Not that Dem pols and bureaucrats can't be just as bad at times, but Coffee County is more than 2 to 1 GOP. 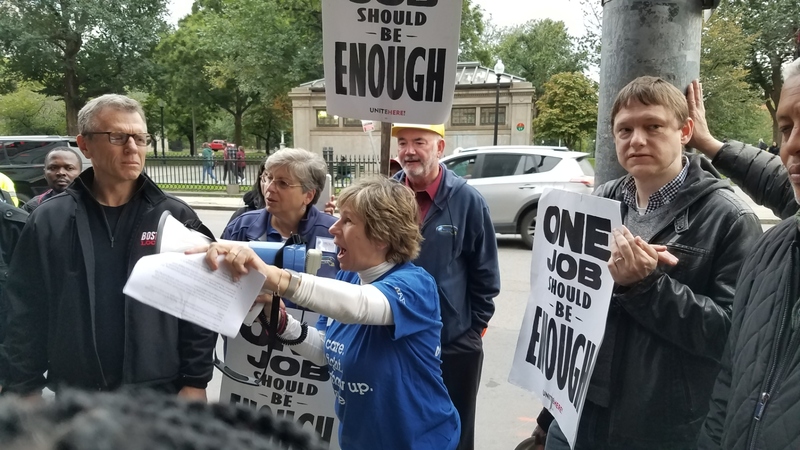 I joined the workers’ picket line in Boston, one of the strike locations, on Monday to demonstrate the AFT’s support and solidarity. The workers are grateful for our support, but we need to do more. You can help right now by taking a pledge to not stay at a Marriott hotel during the strike. It’s not just hotel workers who have to work second jobs or make other sacrifices to take care of their families. Educators take weekend jobs at restaurants or delay having kids or going to graduate school because of low pay. Others, as Time magazine reported last month, supplement their salaries by selling their blood plasma. These striking hotel workers and the educators who walked out of their schools earlier this year are part of the same fight. America needs an economic framework where the dignity of workers—whether teachers or housekeepers—is respected and people are paid a living wage. It’s what labor unions try to do—fighting for one job to be enough to raise our families on, enough to provide the security and safety we need, and enough to allow us to retire with dignity. Marriott is a billion-dollar company, and it’s profitable because of the people who work there. Hotel work can be backbreaking—be it housekeeping, working in the kitchen or the laundry room, waiting tables or the myriad other jobs. The people who put that effort into making Marriott successful deserve their fair share of that success. They deserve to be paid enough so that one job is enough for them to live on. We’re in the middle of one of the most consequential elections of my lifetime. I’ve been crisscrossing the country, working to elect people who share our values and who stand with working people. And I’ve pledged to not cross the picket line. As you know, we can’t show our solidarity only when it’s convenient to do so. Take the One Job pledge. Let’s make sure Marriott knows that America stands with these workers. Not to nitpick (OK, to nitpick), but the NLRB ruled that the picket action in this instance violated a long-standing prohibition against secondary picketing. One could argue over whether it's a good ruling (I would say "no"), but it didn't "make union pickets illegal." An item of bigger concern from the Nazi Labor Reprobate Bastards is their overall weakening of the joint employer standards, which does indeed make it easier for big companies to dodge the law. Last edited by O Really on Tue Nov 13, 2018 2:22 pm, edited 1 time in total. I KNEW you were going to (and should) say that. It's why I made sure to include the text explaining exactly what you point out. I don't know how things work at IN THESE TIMES, but at other entities the author does not write the headline. Well, you know me. I think there's enough horror in Trump administration wreckage without need for exaggeration or distortion. This one really should - and previously would - have been considered joint employment, though, IMNVHO. Several years ago the distinction was drawn between a "payrolling service" and a "professional employment organization." The payrolling service simply provides the software, recordkeeping, tax payments and sometimes benefit programs for employees but has no real control over them in regard to their hiring, termination, work place, schedule or performance. That isn't what this was, and the janitors got screwed. What is remarkable about this case is how it makes things much worse for workers by only subtly reinterpreting the law. The full description of 1st Amendment limitations for unions is depressing. Unions in general have done a really awful job for a couple of decades. They haven't changed with the times, haven't adapted to different working environment and employment culture, and haven't made themselves attractive to workers. Sure, NLRB members and Administrations come and go - some more friendly with unions than others - and you do get the occasional Scott Walker that gets lucky, but back in the day they weren't deterred by a little resistance or legal obstacles. Picture this- how can a firefighter or cop, they of the "band of brothers" and "thin blue line" not only vote "no" on union, but find the union despicable? How does someone like the former poster known as nascar even exist - believing the city unrestricted won't screw them over but the union is? Guy that will believe that probably tells his daughter he'll get her a unicorn for her birthday and keep it in the backyard. How in the world does a coal miner in West Effin' Virginia not join the union? Somewhere along the line, the unions have let themselves become irrelevant to a wide majority of workers. Sounds like the Dems, the peace movement, blacks, Latinos, women somewhat, Muslims, not all tree huggers but definitely the ones hoping to really stop AGW. Even civil liberties is a dirty phrase.